Adobe provides training by teacher expert users on all their products. Learn more about the C2L online educational technology conference hosted by students and professors in the Education Department at SHC. The Technology, Colleges and Community Worldwide Online Conference (TCC Online Conference) is a virtual, professional development event held annually online. This event enables faculty, staff, students, and administrators in higher education worldwide to share their expertise and engage in discussions about innovations and practices related to the use of technology for teaching and learning. To learn more about the Annual TCC Worldwide Online Conference, visit their website. They also provide access to free webinars. Online Community of Inquiry Syllabus Rubric: Dr. Rogers will share a rubric she developed and used to conduct a research study on the current level of community of inquiry (COI) in distance education courses at the University of South Alabama based on faculty’s syllabi. She’ll share the importance of planning for a COI to engender student presence, teaching presence, and cognitive presence in e-learning. It all starts with the syllabus, as your plan of action! Request this workshop for your department. See Powerpoint presentation. Cognitive Benefits of ePortfolio Use: Learn about the research evidence in improving cognitive skills and student achievement with the use of ePortfolios.View Dr. Rogers' PowerPoint. Magis Instructional Design (ID) Model: Learn about this unique ID model that Dr. Rogers developed that includes religion, spirituality, and social justice in addition to intellectual growth. It's inclusive of service to others. According to Dr. Carmody, Jesuit educators try to focus instructional activities on experiential learning to engender the cycle of experience leading to reflection and further action. This is based on the dynamics of Ignatius’ Spiritual Exercises. Additionally, Jesuit school educators include techniques for reflection within their units of study in order to challenge students to serve others (Korth,1993). Are you curious about using Schoology but don't know where to start? Contact Dr. Rogers if you'd like to be placed in her demonstration course on Schoology as a student. 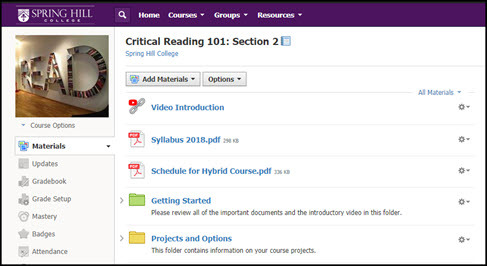 It's a blended course on Critical Reading with best practices such as an introductory video, a Getting Started folder, collaborative projects, and goal setting with students. How to Make Your Online Course Accessible: Learn about the four basic requirements to meet the Americans with Disabilities Act (ADA) for distance education: describe images and hyperlinks, use sans-serif fonts, caption video and transcribe audio, and ensure your PDFs are readable and not scanned images of the printed word. See presentation. Ask Dr. Rogers to place you in the online workshop on Accessibility for self-study. Respondus for Test Migration: Learn how to upload your tests from Word documents or other formats through Respondus to Schoology in a few clicks instead of creating online quizzes one question at a time. You can also migrate test from one learning management system (LMS) to another or obtain them from your publisher via the Test Bank Network. Access the Test Migration folder on the SHC page in Schoology to download the software and obtain the installation passcode and instructions. See video tutorial that covers this entire process from installation to actual use. Creating Instructional Videos with Camtasia Studio: This tool is available for use in the Faculty development center in BL112. Learn how to capture and edit narrated PowerPoints, talking head lectures, or screencast tutorials. How to Create Narrated PowerPoints in MS Word: Learn how to upload existing audio or create and edit your own. See presentation. How to Create an Unlisted YouTube Channel: Learn how to host your videos in the cloud and safely share them with students via YouTube. How to Correct Automated Closed Captions on YouTube Videos: Learn how to use the YouTube video editor to correct the errors in the automatically captioned videos on your channel. See video tutorial. Copyright Issues in Online Courses: Learn four important rules to follow for use of the copyright-protected material in online courses. We cover the use of Spring Hill College's EzProxy link+permalink to share articles in our library's databases the appropriate way. We also cover various resources. See the Copyright LibGuide for more information. Intro to Google Drive: This is an overview of the Google tools (apps) and how to access them from your Gmail account. Google Suite Advanced Features: Learn to use new features in Google Suite (Apps, Classroom, & Drive) to create formative assessments, scaffold instruction for all learners, and provide collaborative projects. Schoology training opportunities are provided in the sign-up form on this page.